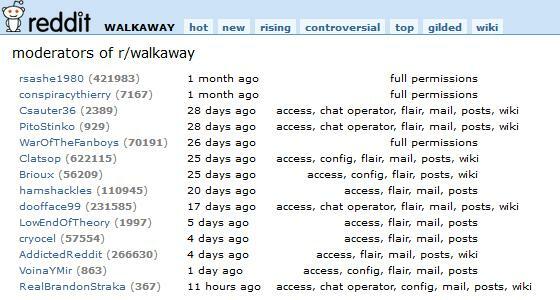 But over at the Reddit WalkAway community, “free speech” moderator Brandon Straka engaged in or permitted the removal and ban of users who asked tough questions or who disagreed. Reddit moderators including Brandon have the power to censor, ban, or allow user comments. 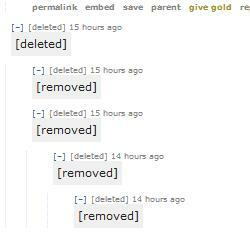 Turns out, the AMA was a festival of censorship. Ultimately, Brandon Straka and the team of WalkAway moderators locked the page down so that nobody could comment anymore. This is a crosspost, approved at the request of the community moderators at r/walkaway. We encourage users to head over and ask questions of their AMA guest, but please be certain to follow the community rules. If it’s so successful how have I not heard anything about it other than in right wing subreddits that are often flooded by Russian trolls? Banned me for asking why despite living in nyc/northeast aka a very progressive area, I have only heard of this “movement” on right wing subreddits. Despite a user claiming this movement has around “5OOK FOLLOWERS” all of this despite the fact the very sub only has 6k users. The way you throw around the word liberal makes it seem like 1. You were never truly a liberal, 2. Are actually a Republican, 3. Are pushing propaganda and a narrative that doesn’t exist. For example”we want our country back” from liberals? Because it’s the republicans that are actively destroying it. Why should we believe you when you say you’re a liberal but do not hold any liberal views? How do we know you are a liberal in the first place? Is there proof such as who you voted for in the past, posts promoting democrats and liberals, etc. or is this more of a take your word for it? What policies did you believe in back when you were a liberal? Have you received funding from any Republicans politicians or PACs? A simple ‘yes’ or ‘no’ would suffice, Brandon. Throughout the AMA, Brandon speaks warmly to those who agree, repeatedly consoling others with comments like “I am so sorry for what you have endured, but you are not alone!” But tough questions — or even questions that are not totally one-sided — remain unanswered, with so many removed and users banned. Isn’t that a sloppy over generalization? Surely you’re not suggesting that “all liberals are this way”. I think there is much of the old guard of Republicanism that needs to take a seat, however, we don’t currently have the luxury of making that our priority. Reality check: the House of Representatives is solidly in the hands of Republicans although the 2016 national popular vote was about even, the Senate is in the hands of Republicans although Americans voted in large majority for Democratic Senators, the White House is in the hands of the largest popular vote loser in American history, and the Supreme Court is in the hands of Republicans thanks to a series of unprecedented tricks to take the seat from Barack Obama. See The Far-Right Has Rigged the American Electoral System. My #WalkAway was a process that unfolded over the course of months. It began with a realization that the media on the left had been SO dishonest and deceptive about Donald Trump and his supporters during his campaign and after his election. This set me on a path of research for the truth. The final straw, when I knew I had to #WalkAway was when Rachel Maddow went on a tweeting frenzy assuring us that she had his tax returns and implying that this smoking gun would put Trump under. What happened next was an hour of television more boring and irrelevant than amateur women’s golf. I just spent time in L.A. and D.C. to support Dinesh D’Souza’s new movie, “Death of a Nation”, and I was recognized by everyone at both events. That was fantastic! I have not been taking clients for about six weeks. I decided about a month and a half ago that saving America AND doing blowouts was just too much! Too much money? Too much fame? Enough to no longer have to work, apparently. Next, he is going to get his singing career off the ground — all for a good cause, himself, just like Donald Trump. 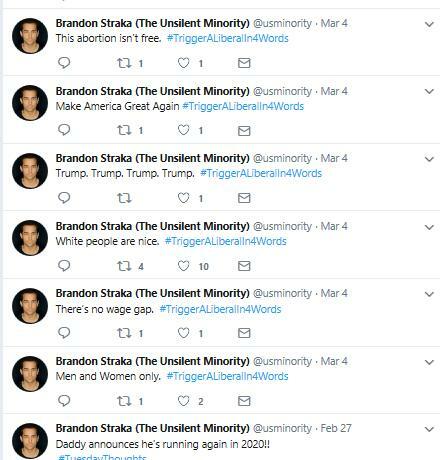 If there is any truth to the Brandon Straka campaign to Walk Away from Democrats, let him show us the evidence. Where are the seven years of Tweets preceding his Trump support, or anything else? I don’t support censorship in any way. This is why I think Reddit is a cool concept. Let the free market decide how people feel about other people’s comments. If that’s true, then he must restore all the censored comments, and remove all the bans on the users at the “official” Reddit site of his Walk Away movement, a place where he is the moderator and has both the official and actual power to do so. Also, unlock the AMA and let the free speech flow.